This is a building on the last project which we constructed a speaker and connected it to a 3.5mm jack for it to work and play out sounds from a computer, cd player, or any standard audio device with a speaker jack. In this project, we're going to now add a potentiometer to the speaker, so that we can adjust the volume output by the speakers. The 3.5mm plug that we're using in this project is a mono plug; it only has two contacts. However, a stereo 3.5mm plug can also be used as well to the same effect. The 3.5mm plug may come in many fashions. It may be a 3.5mm male to male plug, a 3.5mm male to female cable. We are not interested in the other side, only the male side. What we're going to do is take the 3.5mm plug and cut it at any point in the wire. This should expose two wires, a wire which represents the positive side of the male plug and a wire which represents the ground of the male plug. The red wire is the positive terminal and the black wire is the negative or ground terminal. To build this speaker circuit, we connect the 1Kâ„¦ audio taper potentiometer to the speakers. The potentiometer must be a log taper. Linear taper potentiometers don't work with audio because they increase sound too drastically. The potentiometer that must be used is an audio taper. All audio potentiometers are log tapers. Now to connect the potentiometer, this is done by hooking up the positive terminal of the speaker to either one of the two terminals of the potentiometer (doesn't matter which) and then hooking up the wiper of the potentiometer to the positive terminal of the 3.5mm plug. Then we run the ground wire from the speaker directly to the ground terminal of the 3.5mm jack. The ground terminal does not connect to the potentiometer directly. This is now the completed speaker which can be used with any standard speaker jack whether on a computer, CD player, etc. All you have to do is place the speaker into the speaker jack and you should hear sound output if the device is powered and playing sound back. And with the potentiometer, you can change the volume of the speakers to suit your listening needs. This is how all speaker devices operate that have adjustable volume control. All it is is a speaker hooked up to an audio taper potentiometer. Once you have this, you can have volume change. 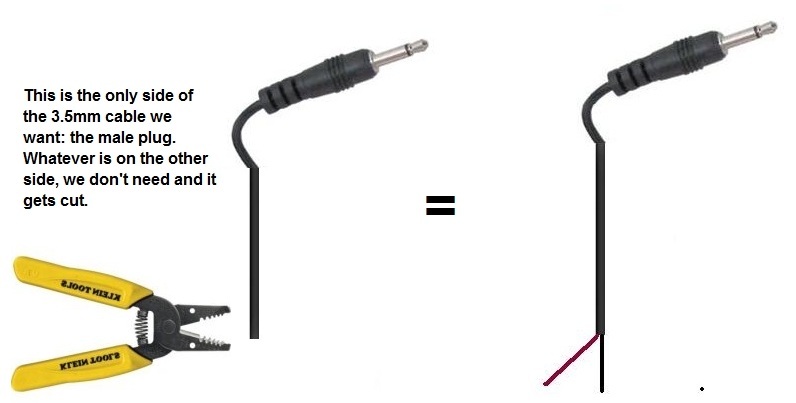 This is how all the headphones operate in the industry.